An electromagnet is an artificial device that does everything a magnet can do and more. They are particularly useful because they can be made to have any field strength desired and to grow stronger or weaker or even turn off. They are essentially just coils of wire wrapped around a metal core and hooked up to a battery. Although they are easy to make at home, they can have a problem with overheating if they are given more voltage than their wires can handle. Fortunately, with careful design, this problem can be avoided. Multiply the diameter of your electromagnet (the distance from one side of the coil to the other) by 3.14. 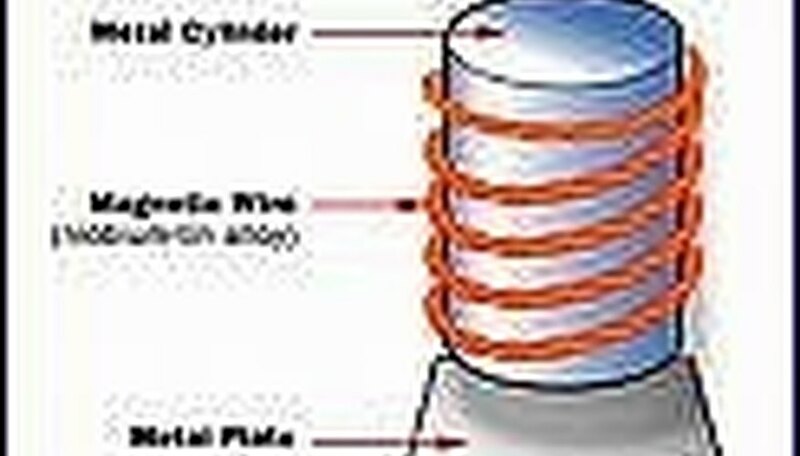 Multiply this figure by the number of turns in the coil you are using. This will give you the length of wire your electromagnet will use. If you measured the diameter in inches, this will be the length in inches. If you measured the diameter in centimeters, this will be the length in centimeters. Look at the wire gauge resistance table and select a wire gauge at random. Look at the number of ohms of resistance that gauge of wire has per foot, meter or your chosen measurement unit. Multiply this by the length of wire your electromagnet will require. The resulting figure will be the number of ohms of resistance your wire will have at that gauge. Divide the voltage of the battery you intend to use by the resistance of the wire you are considering. The result will be the current that will flow in that wire when it is hooked up. Compare this figure to the maximum current rating for that gauge wire on your current rating wire gauge table. If the current your electromagnet will draw is greater than the maximum that gauge is rated for, start the calculations again but with a lower gauge wire. The lower the gauge, the wider the wire and the greater the current it can carry. Repeat this process until you find a gauge that will safely carry the current your device will produce without overheating. The greater the number of coils your electromagnet has, the stronger the electromagnet will be. The higher the battery voltage, the stronger the electromagnet will be. The width of your electromagnet depends on what you want your electromagnet to do. Thompson, Jason. "How to Stop an Electromagnet From Heating Up." Sciencing, https://sciencing.com/stop-electromagnet-heating-up-7183652.html. 24 April 2017.